The all-new 2013 Hyundai Santa Fe crossover utility vehicle (CUV) is having a big impact at Hyundai. Manufacturers closely monitor who their buyers are, and then try to target the ones they most want. This is classic marketing, whereby the “product” is one of the “four-Ps” of marketing. If a company makes a product and then goes looking for buyers it usually has a much harder time making a profit and finding the volume it needs. If, on the other hand, the company knows who it wants to serve, figures out what they want, and then deliver that, all good things follow (usually!) Hyundai has been tracking who is buying the new Santa Fe crossover and it likes what it sees. Hyundai tracks and targets consumers like all manufacturers and the 2013 Santa Fe is an important vehicle for Hyundai. Since its humble roots in America when it offered the least expensive transportation available to those with the least resources, Hyundai has followed the Honda/Toyota business model successfully. It has climbed the demographic ladder step by step and is now starting to get to the customers it wants most. Not all demographic groups behave the same way. Some groups buy a car and then don’t buy another for ten or more years (older customers and those with less resources). Others buy a new vehicle every two or three years, or lease vehicles frequently so they can always drive new. Which do you think the automakers prefer? Some buy only the unprofitable stripped down base model of a vehicle and others buy every bell and whistle, boosting profits for the automaker. Hyundai has recently seen a shift in buyer demographics with the new 2013 Santa Fe. Hyundai knows for certain that 39% of buyers are choosing the powerful, turbocharged engine, rather than the base. That is surprisingly high for any vehicle with two options under the hood. The less powerful engine almost always sells more, but at a lower gross profit. Hyundai also knows that sales are up 15% over last year and the prior Santa Fe was no slouch in that department. Finally, Hyundai knows that its ability to move its Santa Fes off dealer lots ranks about as high as is healthy in this business. According to a third party study Hyundai ranks first in this important category, and is well ahead of anyone else in the segment. Hyundais sell faster than Ford, Chevy, and Toyota competitors. 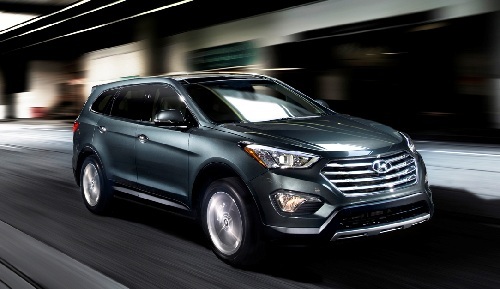 Hyundai is moving upscale in the market and the Santa Fe is leading the way.